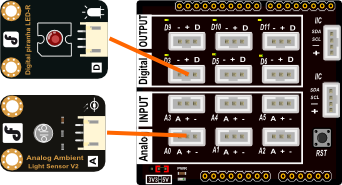 The Cookie I/O expansion shield is designed for beginners to electronics. The shield is directly compatible with the Boson kit. We have implemented fail-safe systems to prevent bad connections from destroying the board. The board is protected from reverse voltage input. And connector ports only accept connections the correct way around. These fail safes make the board ideal for beginners and classroom settings - no need to worry about your students making the wrong connections! 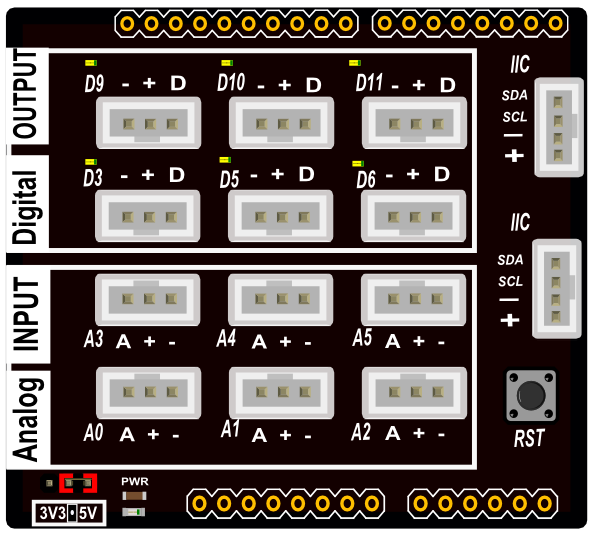 One of the biggest benefits of the I/O expansion shield is increased power and GND pins, allowing you to connect more sensors. 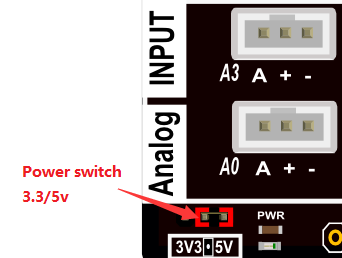 The shield is compatible with 3.3V and 5V logic. Select desired voltage by shorting either the 3.3 or 5v pins as pictured. When there is low ambient light, the LED will turn ON.